The books for Story Hour tomorrow, Tuesday, January 20, are The Snowy Day by Ezra Jack Keats and "The Story of Jonah" from the Read Aloud Bible Stories, Volume 4 by Ella K. Lindvall. We will sing a few songs and perhaps play a rousing game of pin the nose on the snowman. Come and join us for a snowy day Story Hour at The 930 at 10:00 AM! The Keats book is a classic. Over the past two days, we've been reading The Snow Kept on Falling by Kathie McQueary (Weekly Reader Books, 1987) to our girls. What is your favorite children's book about the weather? 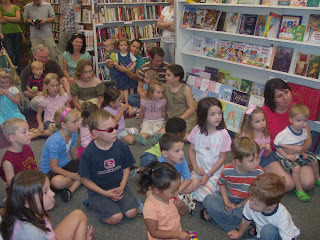 For "Story Hour" this Tuesday at the 930, Lindsey Blair will be reading "God Helps Us" from The Rhyme Bible Storybook. This is the story of the plagues in Egypt. She will also be reading Do You Have My Quack-a book that Lindsey describes as a family favorite. Since both stories involve animals/insects, the kids will also be making paper bag animal puppets. Join Lindsey at 10:00 AM in the 2 year-olds classroom on the second floor.